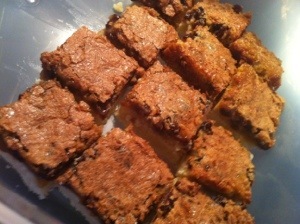 I am alway looking for a new QUICk and EASY but yet still yummy baking recipe. I tried this butter tart recipe last week. It was a success so I thought I would share it with you. Blend the first 3 ingredients for the bottom layer and spread evenly into an ungreased 8by8 pan. Bake at 350* F for 15 minutes remove from oven. Beat eggs and add the rest of the ingredients for the top layer. Spread mixture over the bottom layer. Bale again at 350* this time for 25 minutes. That’s its. Super easy! Super yummy. If you try them let me know how you liked this recipe.